Every now and then I am asked for one of my recipes which is why I will start to publish some of them on my blog. In general I am more interested in a result than in complicated processes which is why I often alter the process of cooking into a more convenient and less time consuming way as long as the result stays the same. When we moved to Australia we suddenly had lemon trees in our garden. Being a big fan of lemons I started to make all kind of things from our lemons. Here comes my recipe for Lemon Curd. For the preparation I use a metal bowl which fits onto one of my pots in which I heat water. The heating over a hot water bath has the advantage that the content is heated slower and more even. Melt the butter in the metal bowl. Wait until the butter and sugar is not hot any more! Grate the Lemons. Make sure that you grate off enough of the white skin as well. The white skin contains most of the Pectin of the lemon which is needed as gelling agent for the Lemon Curd. Add the juice and skin into the bowl. 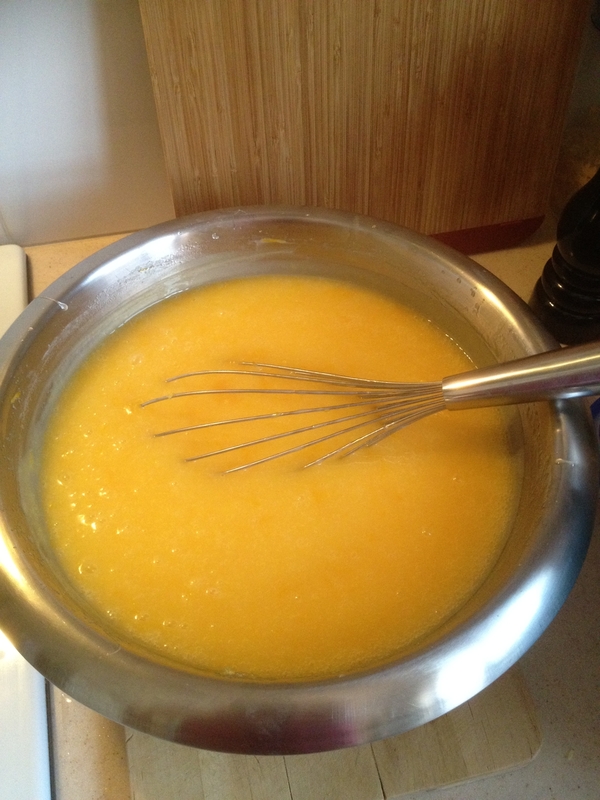 Heat the bowl over the water bath and stir until the Lemon Curd thickens. This can take a moment as you don’t want to push it and heat the pot too fast. There is a danger that the egg falls out and you end up with lemon-egg soup if the curd gets too hot or heats up too fast. Once the gelling process is far enough you can take to bowl from the water bath and let it cool down. Stir from time to time to avoid that a skin builds up on the top. If you intend to fill the bowl I am using in the picture you have to multiply all ingredients times 4x ! This entry was posted in Cooking, Passions and tagged Cooking, Lemon Curd. Bookmark the permalink.